Charlies Salerno, longtime co-leader of The Clam Diggers, prepares for their show at the Sherman Green Gazebo, Sunday, July 16, 2017, in Fairfield, Conn.
FAIRFIELD — A Fairfield native and popular local performer helped put smiles on many faces Sunday evening when her group, The Clam Diggers, performed on Sherman Green. Kyle Ralston and partner Charlie Salerno of New Haven entertained a large crowd for the 18th year in a row with their long-standing ensemble, accompanied by some fun dance moves from members of the Shelton-based Kicks Dance Center. 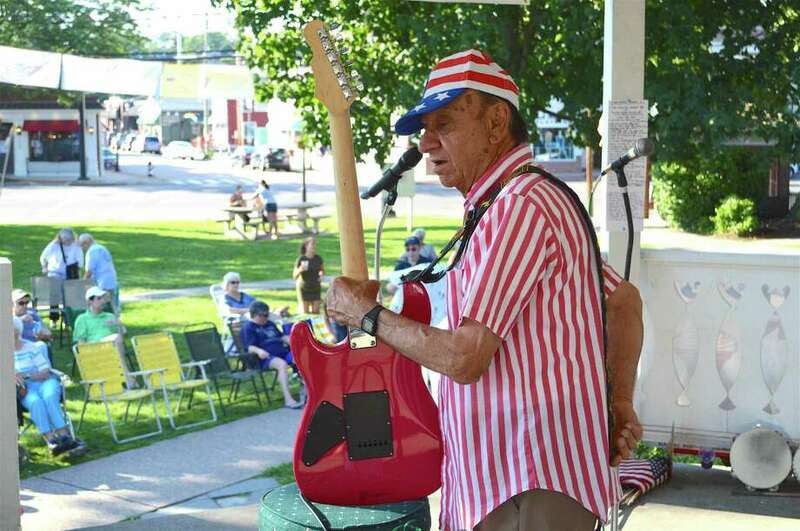 “It’s a little Dixie jazz, regular jazz, and standard songs,” said Salerno. Along with vocals, Ralston accompanied the six-member ensemble by playing the rhythm stick — a percussive conglomeration that includes bells, tambourine, a cymbal and bike horn — which was invented by her grandfather, Roger Connelly, back in the 1930’s.